John Coghlan joined Francis Rossi and Alan Lancaster in their newly-formed band ‘The Spectres’ in 1962. The group went through a series of name changes, including Traffic Jam, before becoming Status Quo in the late 60s when Rick Parfitt also joined the line-up. In the years that followed, a string of chart-topping albums and an almost endless stream of hits included Pictures of Matchstick Men; In My Chair; Paper Plane; Caroline; Down Down; Rain; Wild Side Of Life; Rockin' All over the World, and many more. For Quo fans and critics alike, this time is often regarded as Quo’s "Classic" period. Since leaving Quo John has worked with many noted and diverse musicians, in his own Diesel Band; with Partners In Crime; and the ‘Rockers’ featuring Phil Lynott, Roy Wood and Chas Hodges. Other collaborations have included Noel Redding (ex-Jimi Hendrix) and Eric Bell (ex-Thin Lizzy). In 2013 and 2014, John rejoined Francis Rossi, Rick Parfitt and Alan Lancaster for the two sell-out Status Quo Frantic Four Reunion Tours, selling out all over the UK and Europe and reigniting the excitement of the early days of Quo. 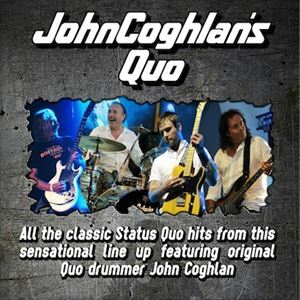 John Coghlan’s Quo has enjoyed regular gigs all over the UK and Europe recreating an authentic “70’s Quo Sound” in keeping with John’s time with Quo. Aside from John on Drums, the band features long-term member Mick Hughes on Guitar & Vocals, Rick Chase on Bass Guitar & Vocals and completing the line-up Rick Abbs on Guitar & Vocals.